Imagine how it would feel if you could relax and enjoy life more…. How great it would feel to not feel overwhelmed all the time. Sounds so amazing, doesn’t it? I know how it feels getting caught up in everyday life that you’re just left feeling exhausted. We can be so stubborn sometimes, that we end up taking on too much and then we are left in a constant cycle of just getting by. Seriously....Why do we do this to ourselves?! Y'all...there is so much more to life than that! 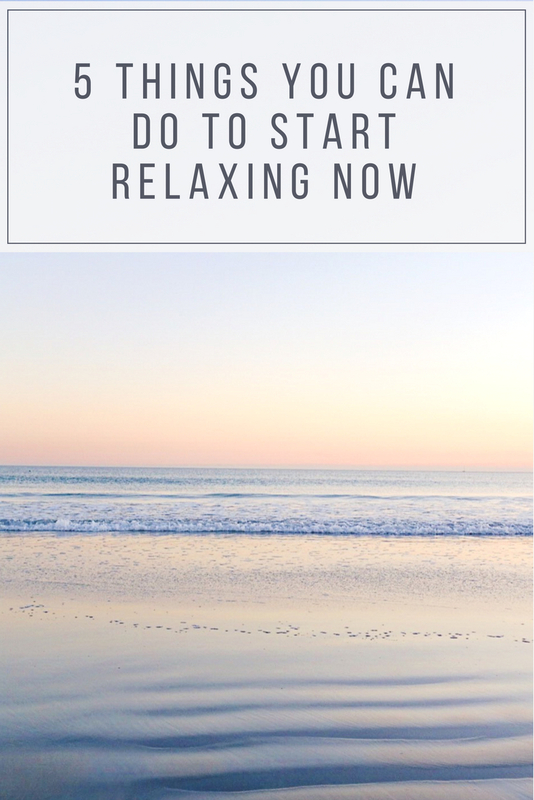 Here are my top 5 strategies to start relaxing more, and the best part is that you can start doing these things right now so you can start relaxing even sooner. "No" is now one of my new favorite words… okay okay, I’m kidding… sort of. Seriously though, it’s time to start making your time a priority and the first step to doing that is to realize that the word “no” is not a bad word. We weren’t made to do everything so why do we keep trying? Protect your time and sanity by saying no more to the things that aren’t a priority or stresses you out. I get giddy over this one. Do me a quick favor… take a look around your house. Now, think about all the stuff you have out. Now, think about all the stuff you have stored away….. Now out of everything you have, think about all the things that you are holding onto that you haven’t used in the last year. Yep…. You have way more things than you realized, right? Now think for a minute about getting rid of all the things that don’t hold sentimental value to you and that you haven’t used recently….. starting to feel a little lighter? When you clear out things, you’re not only clearing out your space but you are clearing your mind at the same time. Fewer things to keep up with, fewer things to clean (can I get an Amen?) fewer things to think about. Who doesn’t love a little bit of “me” time? We are often taking care of everyone else, that we tend to put ourselves on the back burner… it’s no wonder that we constantly feel overwhelmed and exhausted. We must learn to make ourselves a priority again. Carve out some time to take care of yourself, whatever that looks like for you… for example, I love a good dance session… it’s truly the only cardio I enjoy. Whatever is your thing, do it! Ahh, guilt…. Truth time, you feel guilty often don’t you?… that first tip of saying “no” stung a little bit right?… don’t even get me started on the “me time” …. We have to let go of the guilt. None of these tips are being selfish, so push that guilt to the side. Here’s the thing, when you are keeping your values in life, you are kind to others and you are keeping your priorities straight, then there is absolutely no reason to carry around guilt with you. Can you see the light at the end of the tunnel yet? Are you already starting to feel less overwhelmed?! I’m not saying that there won’t be times when you can’t relax as much as you would like, but I promise that you start putting these tips into action…you will start relaxing more. Life is too awesome to stress it away. So….You with me? Are you ready to start living life more lovely? !… Awesome! Let’s do it!